On 24 October 2017, representatives of the international community of designers, architects, planners, and landscape architects signed the Montréal Design Declaration at the first international Design Summit Meeting. The declaration proclaims the potential of design to achieve global economic, social, environmental, and cultural objectives and includes a dramatic call to action to professionals, educators, and governments as well as a list of proposed projects. The Design Summit meeting was conducted within the framework of the World Design Summit, an event that included a multidisciplinary Congress and Exhibition. 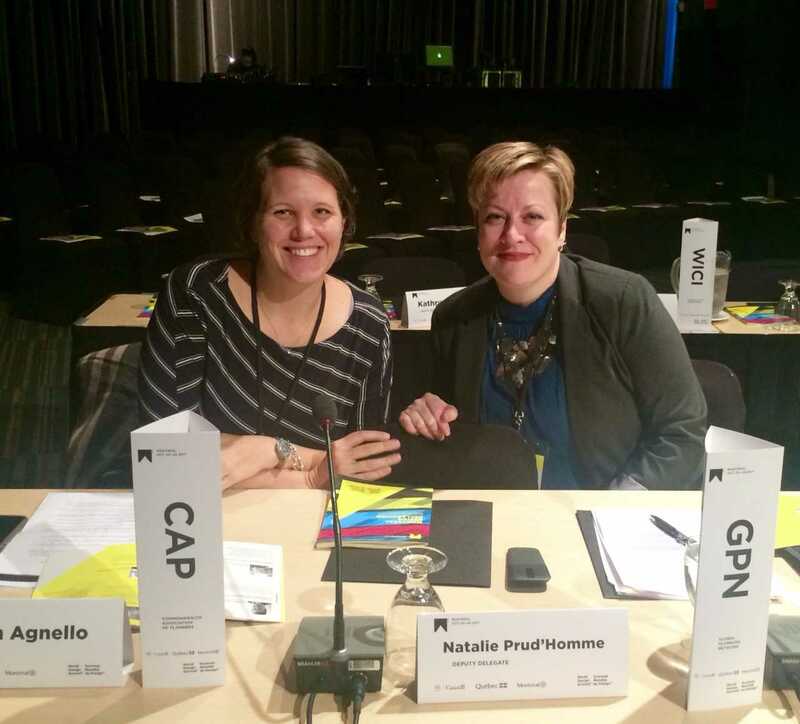 Eleanor Mohammed, right, represented Global Planners Network and Kristin Agnello represented the Commonwealth Association of Planners at the 2017 World Design Summit. Photo by Jeff Soule. The signing ceremony was conducted on 24 October 2017 at the Palais des Congrès in Montréal, in the presence of three UN agencies (UNESCO, UN-Habitat, UN Environment) by the 14 international organizations and partners, including the World Urban Campaign (WUC) representing over 150 global organizations from civil society including Global Planners Network. The Montréal Design Declaration lists more than 600 professional associations, universities, and design promotion entities in an Annex, all of which collectively represent 89 countries. The declaration is a Call to Action, consolidating a broad spectrum of design disciplines, to speak with a unified voice on the value of design across the board, to get the ear of governments, educators, and civil and private sectors to engage with design. It is also a call to designers themselves to step into a leadership role. The declaration calls for Design Advocacy, Development and Application of Design Metrics, Development of Design Policies, Development of Design Standards, and Enhancement of Design Education. As part of the practical intent to go forward, it outlines a list of 20 proposed projects to rally around. Participants see the implementation of the Sustainable Design Goals (SDGs) and the New Urban Agenda as a key goal for the Montreal Design Declaration. The declaration reinforces these global goals and indicators rather than adding a competing framework. I encourage you to share, circulate, and promote the Montreal Design Declaration throughout your networks.